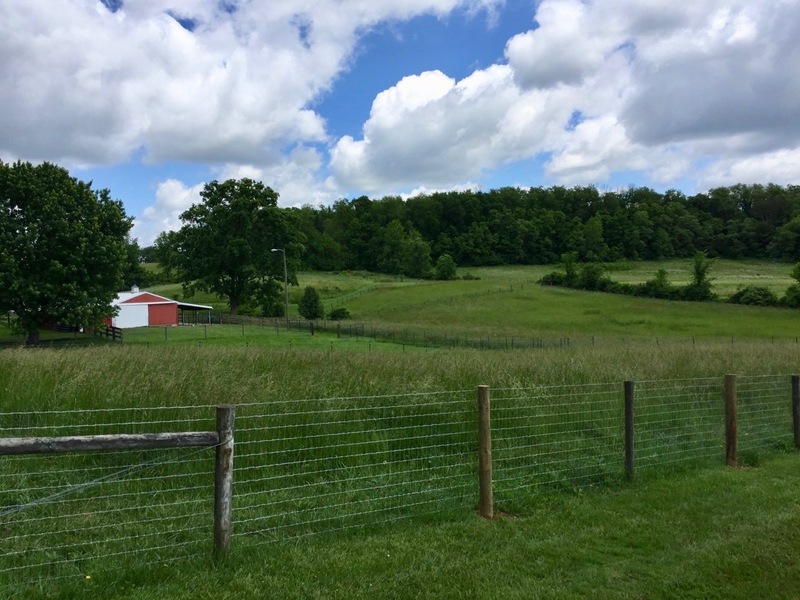 It’s two months today since our fiber boys were delivered to their new home here at Mossycup Farm. They seem to be getting settled and we’re finally focusing on some things other than farm setup (like preparing for our next son’s arrival). For awhile there, we were spending every available moment of every day in some task or project to prepare for their arrival. It feels nice to have it all done (finally), at least to the extent that it will exist for the next couple of years! We’re proud of ourselves for all we’ve done since moving in last August and because I’ll be using this blog as a way to document our progress in all things farm- and business-related, I figured we’ll do a little rewind now to talk about our layout, tools & supplies used and a timeline of the work done. 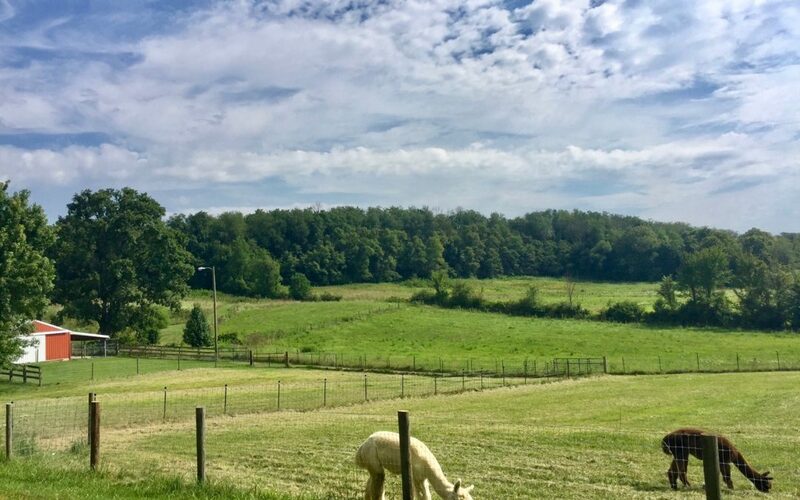 We purchased our alpacas in mid-September and the sellers agreed to board them for up to one year at no charge so that we could have sufficient time to get things set up here. When we met with them before the purchase, we brought a copy of our proposed layout to hear their thoughts on it. They ended up helping us tweak it a little to work better for us, which we were very thankful for. We ended up shortening the aisle to end with a gate into pasture 2 instead of extending all the way to the perimeter fencing. This saved us several panels. We also learned that the best location for a gate is normally in a corner, so that the alpacas can easily be herded through different spaces. Not long after, we rented a truck and headed to TSC for all our cattle panels, goat panels and t-posts. 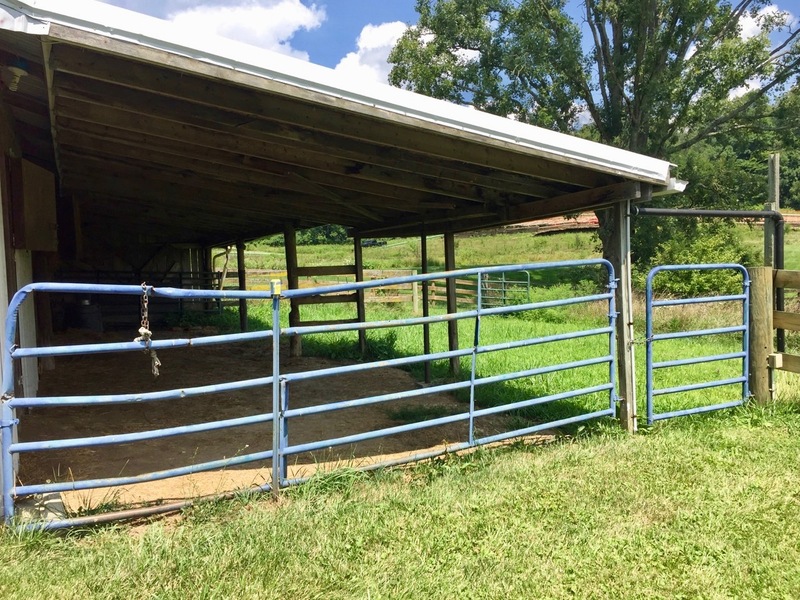 The goat panels (4” x 4” opening) would be used as a semi-permanent back perimeter and the cattle panels as the interior fencing to divide our two pastures. While they aren’t the ideal non-climb fencing normally used for alpacas, they will give us some flexibility as we need to change things in the future (hopefully due to growth!). We also ordered some of the black Zareba t-post insulator caps to give a smooth top to our posts and in case we decide to add electric wire later on. We set all the t-posts 8 feet apart, because our panels are 16 feet. They are fairly easy to pound in with a post pounder and the main challenge for us was working around a Marathon pipeline and keeping our line straight (our string got caught up at one point and set us off course). While a 16-foot opening for our aisle and gates would have been a great feature, we decided to keep everything to a maximum of 12 feet. Over the winter we got a little break from farm setup projects (and found out we were pregnant with boy #2! ), but when things started to thaw and turn green this spring we were ready to get to work again. As May approached, I realized I was only getting bigger and the weather was only getting warmer, so I told Tom “May is our month! Let’s do this.” We had put in all the interior fencing, as well as the back perimeter fence and so had what we felt like was a good start to things. Only one panel at the end of each row had been left out, in order to leave access for stretching the permanent perimeter fencing on the inside of the posts. Before winter came, we’d gotten several fencing quotes, but had also tossed around the idea of doing it ourselves. Our mentors had stretched their own fence and given us plenty of tips and tricks. They also offered up their stretcher bar and swedging tool for us to use, which was awesome! They had confidence in us, so we took it and ran. After all, the worst case scenario was calling for professional help if we failed. From then, we committed to the project and collected our supplies. We ended up with 500 feet of 48” Red Brand non-climb horse fence (2 x 200’ rolls and 1 x 100’ roll – these rolls are massive by the way, weighing in at 240 pounds each), a farm cart, a huge box of 1 1/2” fencing staples, 10 & 12.5 gauge crimp sleeves for splicing, fencing pliers and a wire twisting tool. Other tools which we didn’t need to buy, but used were: regular pliers, 3-pound sledge hammer, wire cutters, stretcher bar, swedging tool and a post hole tamper. We rented a 1 man, 5.5 hp auger with 6” and 8” bits from Sunbelt Rentals. So, where did our work begin? 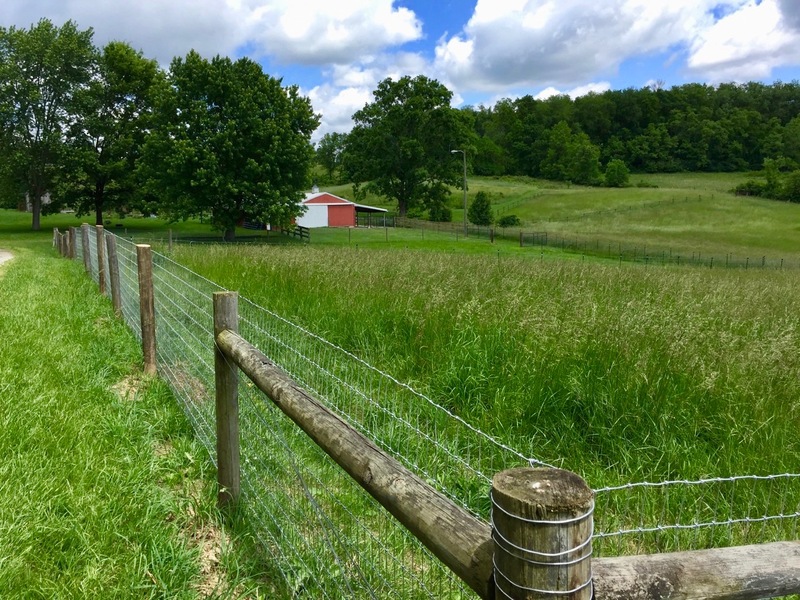 We started with this: An existing fence running north-south next to our driveway and a connecting east-west fence along the front of our property. The posts were set in the 80s, but appeared to be stable and in decent shape. The fencing was a combination of high-tensile and electric polytape. Although time consuming, one of the first things we did was to remove all the existing fencing and hardware. All we needed for that was a socket wrench set and screwdriver (we used a drill bit). We rolled up all the fencing and stored it in the barn (I ended up selling all 1400’ of the brown polytape a couple months later). We also removed all the old corral gates (eight of them) and sold those as well, thanks to a couple great farm groups on Facebook! Once we were down to bare posts, we measured all of our gaps and discovered some 15-foot, 20-foot, even 25-foot spaces between posts. Our mentors advised us to keep the posts 8-10’ apart, so we needed to add one or two posts between each of the old ones. 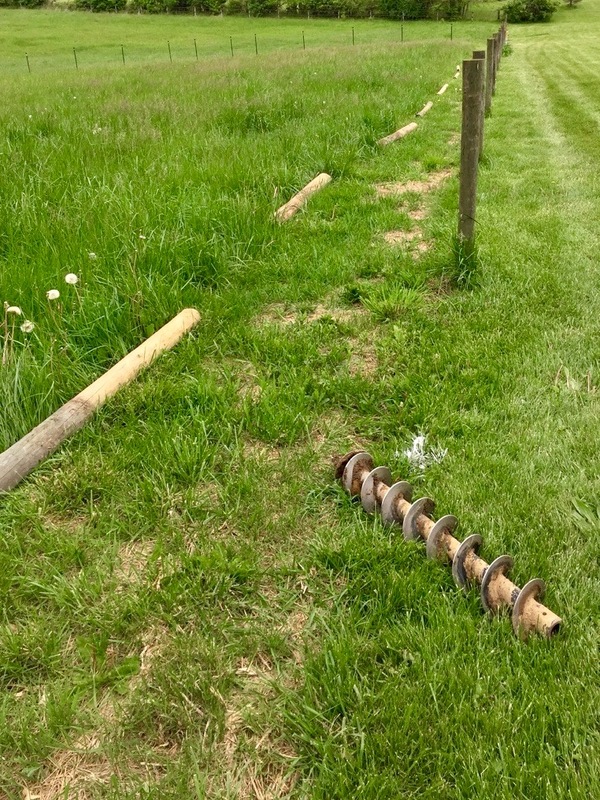 It worked out well, because Marathon had recently pulled out some of our old posts in another unused pasture during maintenance on one of their pipelines. We told them not to put them back in and instead transported them down to our work site. We also found the two 8” posts we needed just laying around. The rest of the posts were purchased from our local TSC (not all of their posts were great, but we picked out the best ones). On Cinco de Mayo, I picked up our auger and bits from Sunbelt (in my station wagon *giggle*) and headed home to wait for Tom to get off work. We needed to dig our first two holes with a rep from Marathon Pipeline present, since we were working close to one of their lines. There were no margaritas that night, but if I wasn’t pregnant, there would have been many. I became super stressed when, in the rain, our auger got stuck in the first hole and the bit kept breaking off from the auger no matter what we tried. We went back to the house, leaving behind a muddy mess and nothing to show for it. Not a good start to our already overwhelming fencing project! Fast forward to the next two days (Saturday & Sunday). We had sunshine and another auger to replace our dud. Thirty-one holes were dug that weekend and our posts were set that. For this, I have to thank my wonderfully patient and strong husband, who was determined to get it done and did. Packing the dirt back around the posts ended up being one of the most time-consuming and annoying parts of the project. We used a manual tamper and as the dirt and clay settled, we went back around again and again and again until they were all in securely. 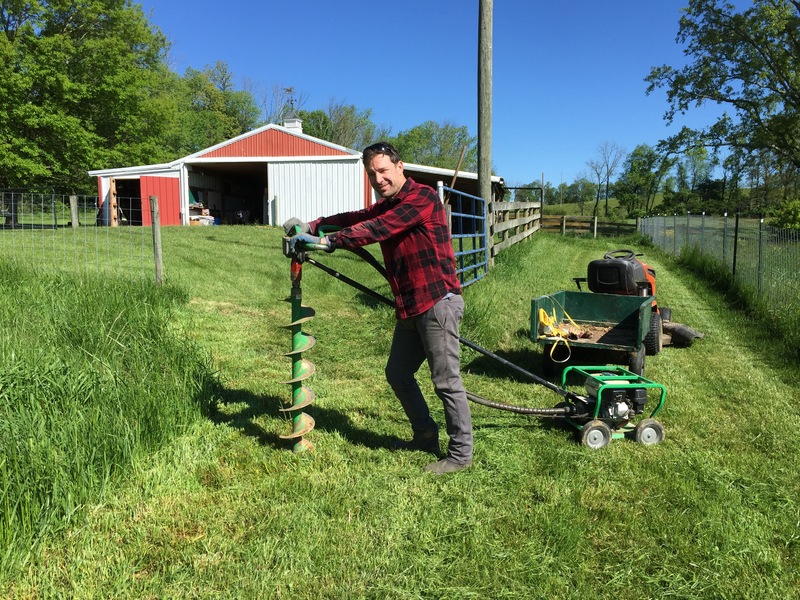 We didn’t use gravel or cement in our post holes and used an auger instead of having the posts pounded in. If we set posts again (which I’m sure we will at some point in the future), we’ll definitely find a way to pound them in next time. Lesson learned. By the following weekend, we were ready to stretch some fence. Tom’s awesome mom, Nancy, came up (for the second weekend in a row) to watch our son while we worked and we headed out early that first morning. It’s important to have all corners and ends of your fence braced with a horizontal post. We were lucky to have those in place already, so didn’t have to add any. The evening before, we had wrapped our first section of fencing around the corner post. There are video tutorials on this part I’m sure, but I’ll explain how we did ours. We made cuts across all the vertical wires, one row at a time and twisted the “knots” with regular pliers to unlock and pull them off. Once we had enough bare horizontal wires to fit around the post and then some, we wrapped each wire around and back onto itself using a wire twisting tool. We then used fencing staples to hold each row in place. This doesn’t sound like a huge project, but it took us quite awhile and so we had the right idea by taking care of that part the night before. I can’t remember for sure now, but I think we ended up stretching the whole fence 40-50 feet at a time. Some can stretch a lot more, it just depends on your terrain and what type of equipment you have at your disposal. I know it’s possible to stretch from a temporary post, but we were able to avoid that thanks to a neighbor who helped us out by letting us use his ATV with wench to pull from. So, the process was basically rolling out the fencing, attaching the stretcher bar (there are all different kinds, including homemade), and then slowly reeling in the wench until tight. Sounds easy enough, but there were some challenges along the way in getting the tension adjusted just right to avoid “blousing” due to changes in terrain. We allowed the fencing to “float” on all the posts by leaving room under the staples, except for any that we stopped at when stretching. Those got staples diagonally across and hammered all the way in. We used the crimped sleeves and swedging tool to splice the sections of fencing together as they came to an end. One row of vertical wire was removed on each end to make our job a little easier. Because it was difficult to get all of the posts in at the same depth, Tom ended up taking his chainsaw to the tops of some of the posts for a more consistent look. Then, after the end posts were wrapped, the job was finally done. It took most of one weekend to complete. 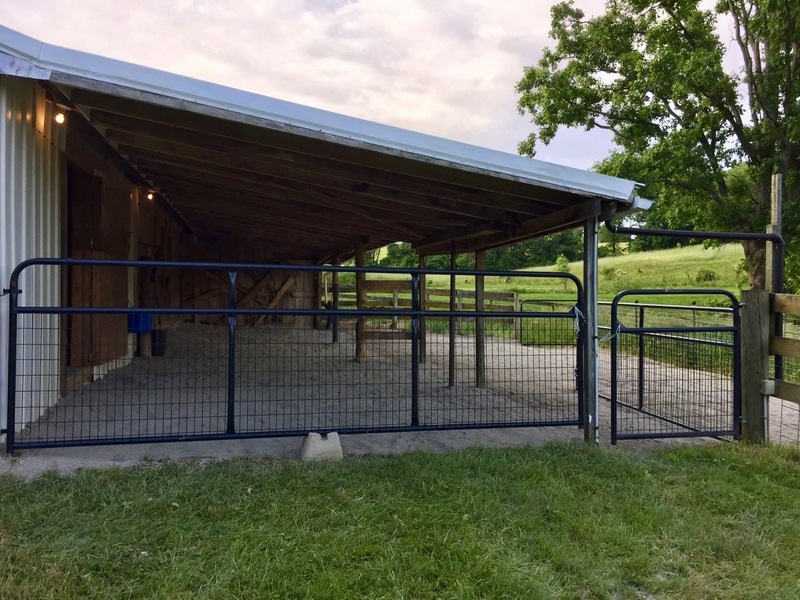 We had several smaller stretches of fencing that were needed over by the barn and ended up using the rest of our cattle & goat panels to cover those areas. Where we couldn’t use staples to secure the panels to the posts, we overlapped them and used these brilliant spiral-shaped wire panel connectors. They were so easy to use and provide a really secure seam. We’ve been asked multiple times already where we found them! The final piece of our fencing project was the gates, which really weren’t too hard to install. 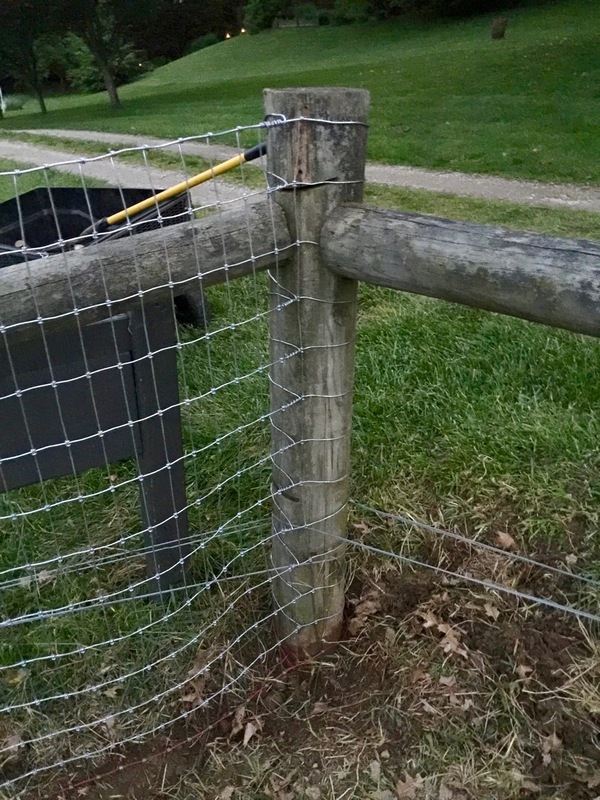 We used a large open-ended wrench to remove all the hardware from the old corral gates and then put the new hardware right into the same holes on the old posts. We had a few gates to install in new locations too and those just needed to be leveled and marked, then holes drilled with a bit slightly smaller that the hardware. 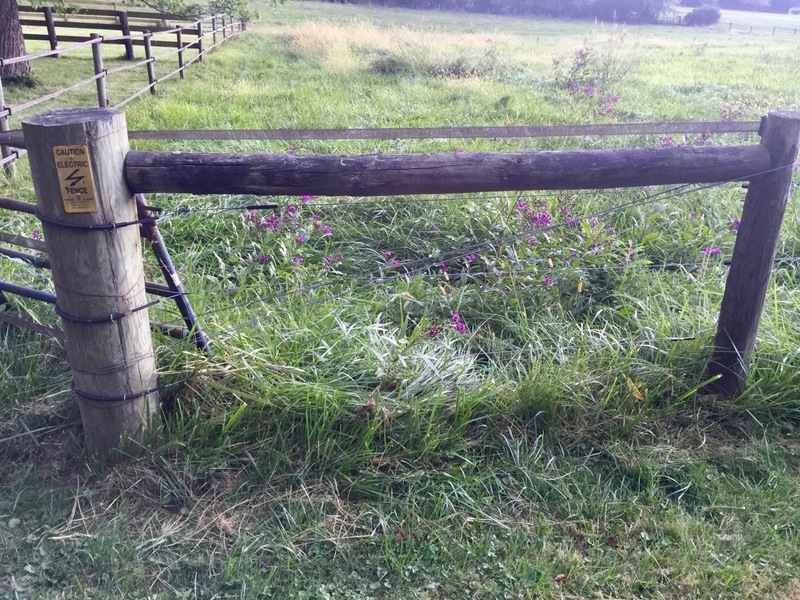 Pretty simple compared to the rest of our fencing “adventures”! Oh, but we weren’t done yet. It was now the third weekend in May. Next, it was time to get the dry lot set up. After chatting up our Alpaca Farm Life group, we decided to use limestone screenings as our ground cover. 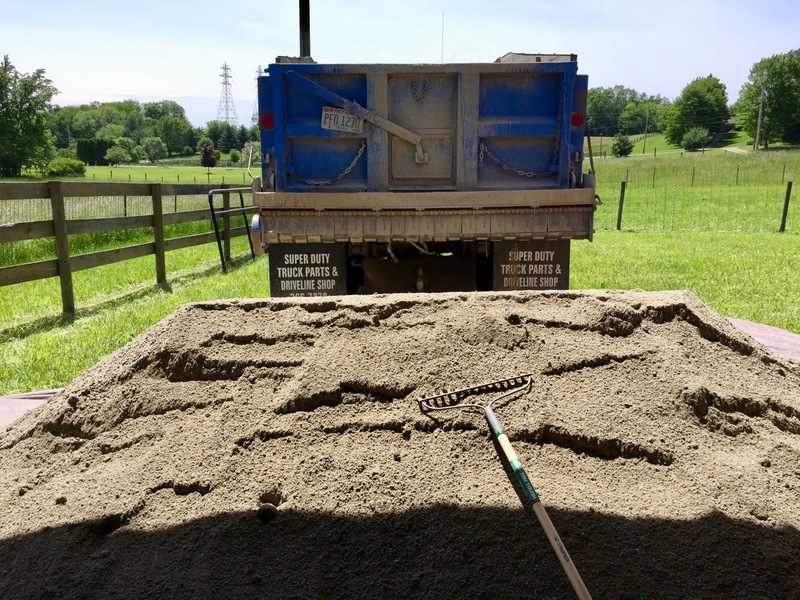 I’m so glad I turned to this group for help, because we had planned on renting a sod cutter to remove all the grass prior to spreading our limestone. Nope, they said. Just cut the grass as short as you can and spread the limestone around 4” thick. The grass will die off and whatever does come back through the alpacas will eat. This saved us money and labor and has mostly held true. We spread the limestone 2” thick in the stall, 3” under the overhang and 4” in the exposed grassy area. There’s only one type of weed that seems to be growing out there and the boys won’t touch it. Other than that, we’re really happy with the space we created. 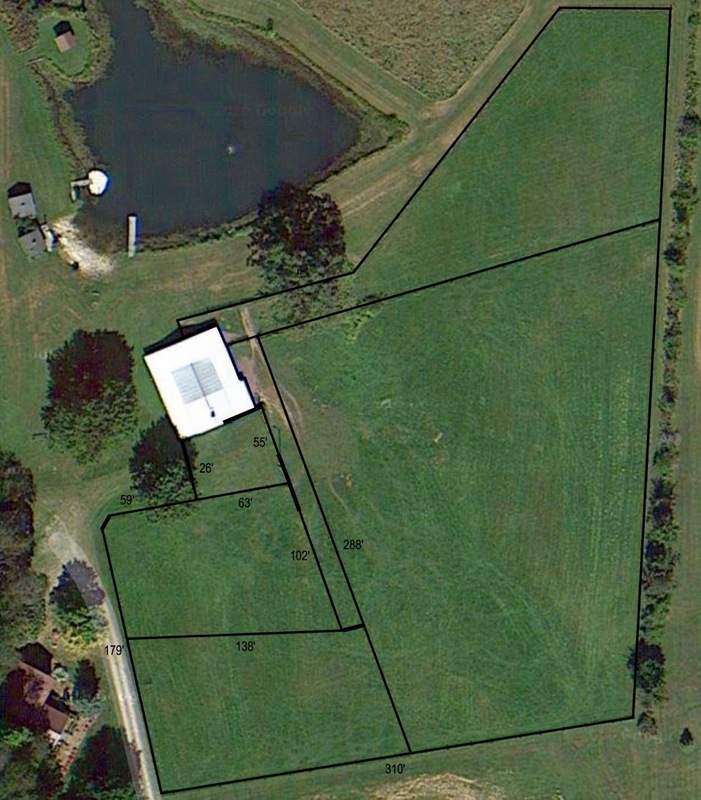 Our barn has a large overhang across the back of it and the dry lot is in that area. It provides part shade and part sun. We knew the dump truck probably wouldn’t be able to get all of the limestone under the overhang, so we spread a few large tarps over the grass before they came. This worked out really well and we didn’t lose much, if any, of our material in the grass. We ordered 16 tons, but received closer to 17. For the record, this is a lot of limestone to shovel & rake out. We really underestimated the amount of time it would take us to get this done. I think it was a couple (or few) days even. I shoveled, dumped and spread the limestone screenings for 3-4 hours the day it was dumped and the following day, while Jasper played around in it with his toy John Deere dump truck and shovel. For once, I didn’t have to find something to entertain him! When Tom got home, we all worked until dark. For some time, we even worked underneath a tarp tent we made to keep the rain off the limestone. When this stuff gets wet, it really sticks together and hardens, so we were careful not to let it get wet. After we raked out the final little pile, we took a deep breath and both admitted that was the worst part of our farm setup. I just kept thinking about our alpaca boys and how much work we had gone through so far just to get them home. They had no idea! The following weekend we worked to tie up some loose ends and the boys were dropped off on May 26th. The rest is history. Thanks for reading! We’re so proud of everything we’ve done here so far. 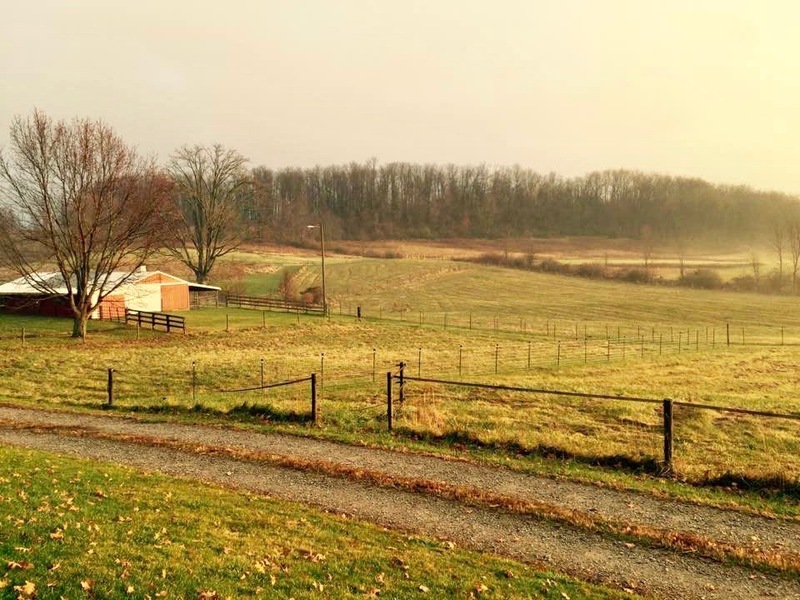 Please follow us for many more farm adventures and projects!